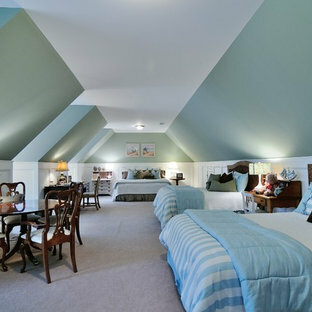 We took this unfinished attic and turned it into a master suite full of whimsical touches. 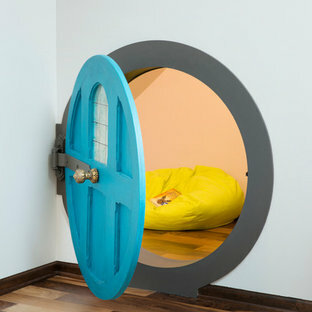 There is a round Hobbit Hole door that leads to a play room for the kids, a rope swing and 2 secret bookcases that are opened when you pull the secret Harry Potter books. Our inspiration was from the Designers Guild fabric, to hand paint the stripes on the wall, with the round sofa swiveled to watch television and no doubt play on! The iconic bubble chair is never out of place, a timeless, fun piece to hang. 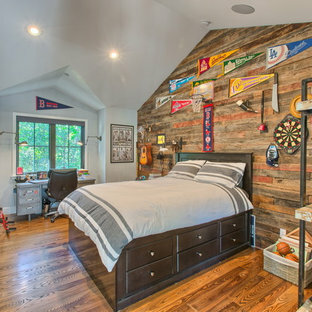 Wood Blinds - Lafayette Wood Blinds are Heartland Woods, their Faux Wood Blinds / Composite Wood Blinds / Hybrid Wood Blinds are Fidelis and Wonderwood. They also have a Light-Ban slat system that eliminates rout holes so light won’t sneak through and makes it easy to clean by just slipping the slats in and out. 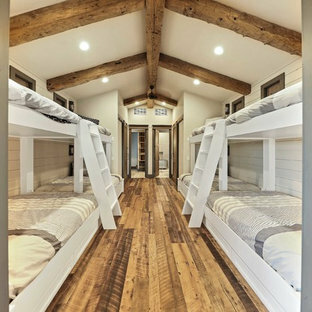 Rich stains, designer colors and a selection of slat sizes for any kids room design style. Wood blinds generally come in 1 3/8 inch, 2 inch, 2 1/2 inch slat sizes. Generally, the smaller wood slat sizes work better for smaller windows and larger slat sizes look better in larger windows. Large slats also have more scenery to view. Windows Dressed Up is your Denver window treatment store for custom blinds, shutters shades, custom curtains & drapes, custom valances, custom roman shades as well as curtain hardware & drapery hardware. Hunter Douglas, Graber, Lafayette Interior Fashions, Kirsch. Measuring and installation available. Servicing the metro area, including Parker, Castle Rock, Boulder, Evergreen, Broomfield, Lakewood, Aurora, Thornton, Centennial, Littleton, Highlands Ranch, Arvada, Golden, Westminster, Lone Tree, Greenwood Village, Wheat Ridge. Home decor window treatment decorating ideas for bathroom, living room, bedroom, kitchen, home office and patio spaces. Photo: Faux wood blinds by Lafayette Interior Fashions - Kids room design. The house is located in Conyers Farm, a residential development, known for its’ grand estates and polo fields. Although the site is just over 10 acres, due to wetlands and conservation areas only 3 acres adjacent to Upper Cross Road could be developed for the house. These restrictions, along with building setbacks led to the linear planning of the house. To maintain a larger back yard, the garage wing was ‘cranked’ towards the street. The bent wing hinged at the three-story turret, reinforces the rambling character and suggests a sense of enclosure around the entry drive court. Designed in the tradition of late nineteenth-century American country houses. The house has a variety of living spaces, each distinct in shape and orientation. Porches with Greek Doric columns, relaxed plan, juxtaposed masses and shingle-style exterior details all contribute to the elegant “country house” character. The painted circles gave ample opportunity to the creative side for the children, as it was specially treated to draw on!